n 1909, Filippo Tommaso Marinetti—a member of the Italian literati who had studied in Egypt, France, and Italy—published his radical Futurist Manifesto, a document whose exaltations of technological disruption ignited the Italian Futurism movement. 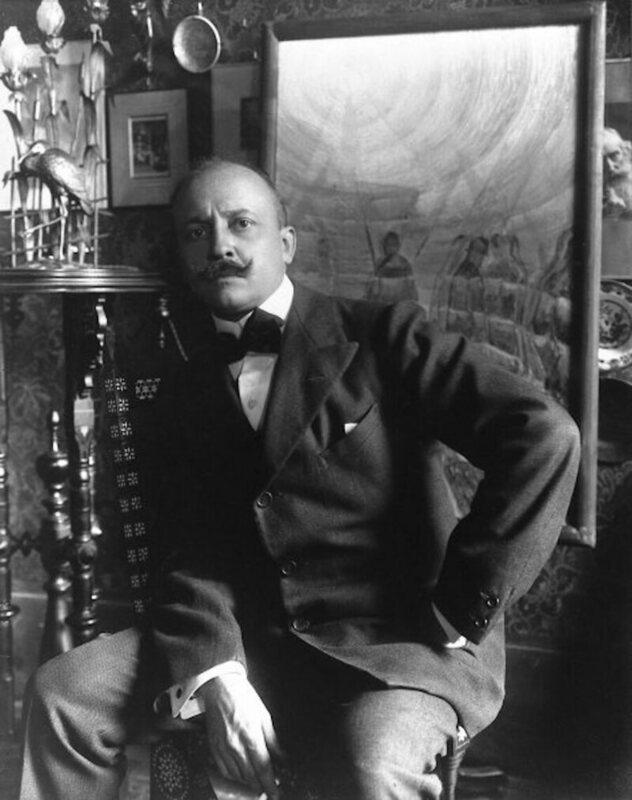 Marinetti called for art that embraced new innovations like automobiles, glorified war, “fought” morality, and did away with libraries and museums, which focused too heavily on the past. 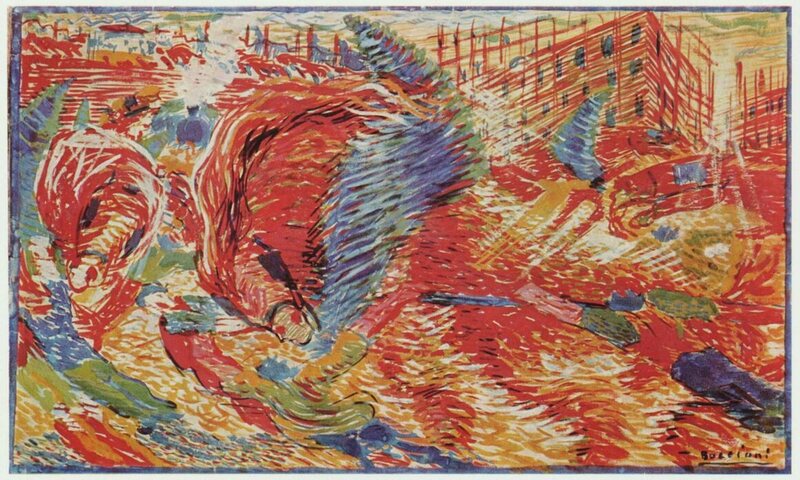 The Italian Futurism he spawned revolted against the old: Futurist poetry, for instance, often discarded grammar rules and appeared in non-linear jumbles, while Futurist paintings experimented with perspective and a collapsing of space. Fashion was a particular fascination of Futurists. 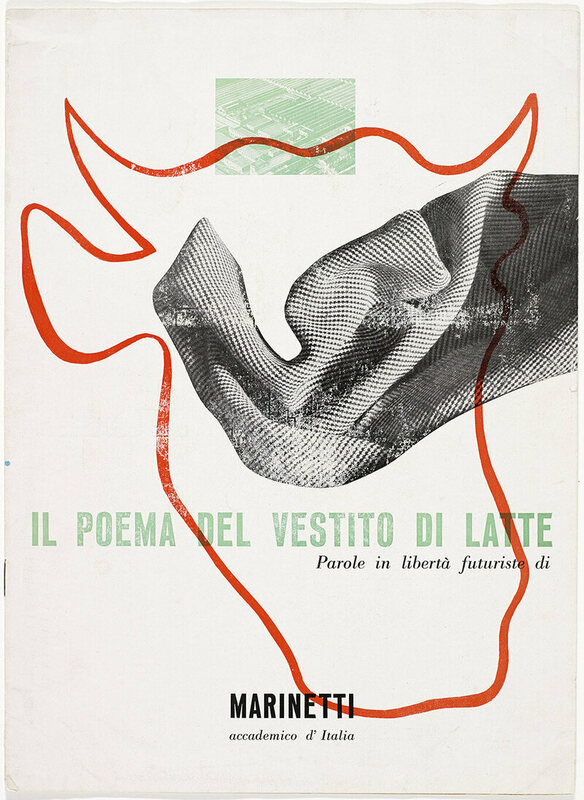 Since 1914, with the publication of Giacomo Balla’s “Futurist Manifesto of Men’s Clothing” manuscript, the debate over how Italians should dress raged within Marinetti’s circles. Futurists wanted manufacturers to craft clothing out of “new revolutionary materials,” such as paper, cardboard, glass, tinfoil, aluminum, rubber, fish skin, hemp, and gas. In 1920, the “Manifesto of Futurist Women’s Fashion” added a new material to this list: milk. The idea was not entirely novel. Between 1904 and 1909, German chemist Frederick Todtenhaupt attempted to turn milk byproducts into a fibrous silk substitute. Though his efforts failed, their underlying premise intrigued Marinetti’s band of Futurists. Many began to speculate that milk was the fabric of the future and would one day comprise all styles of dress. It wasn’t as crazy as it might sound. Wool is a protein, so on a molecular level, it has a very similar structure to casein, the protein found in milk. Chemists simply needed to figure out how to process casein in a way that emulated the texture of wool. Thus, for milk-based clothing to happen, Marinetti and the Italian Futurists needed to wait for the technology to catch up. That moment came during the 1930s, when Italian Prime Minister Benito Mussolini began his push for the country to achieve economic self-sufficiency. Mussolini had stormed into office in 1922 amid popular resentment for what many saw as British, French, and American stiff-arming in the Treaty of Versailles. Marinetti was one of his early proponents. In 1919, Marinetti’s short-lived Futurist Political Party—an attempt to bring Futurist ideas into government—merged with Mussolini’s Italian Fascist Party. The two were associates—Mussolini once called Marinetti a “fervent Fascist”—and they shared the goal of strengthening Italy’s economy in preparation for coming wars. One way they accomplished that? Milk clothing. Like many in the Fascist government, he pinned his hopes on artificial fabrics, a market in which Italy proved dominant. As the Futurists had earlier proposed, many Italian companies began using organic materials—rather than less-prevalent silks and wools—to develop textiles. 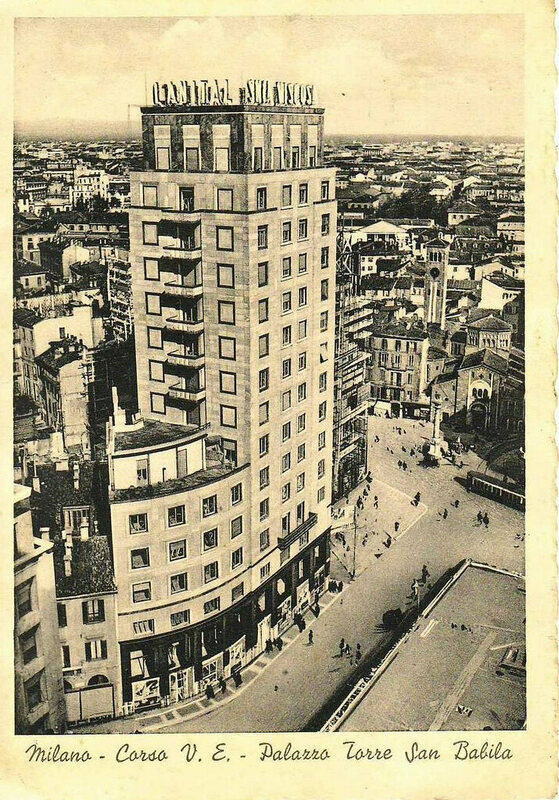 Italy’s first great success came with rayon, an artificial silk made of cellulose. In 1929, the nation became the world’s leading producer of the material, boasting 16 percentof total rayon output. The party responsible for the lion’s share of that rayon was a textile company known as SNIA Viscosa. 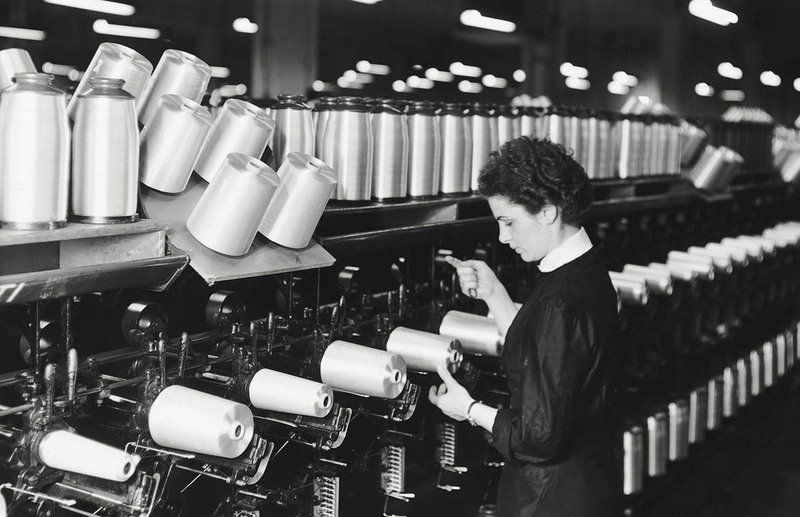 By 1925, SNIA accounted for 70 percent of Italy’s artificial fibers, growing so large that it became the nation’s first company to be listed in foreign stock exchanges (in London and New York). And in 1935, SNIA Viscosa acquired the rights to a new kind of fiber: a milk-based synthetic wool that, building on Todtenhaupt’s earlier work, the Italian engineer Antonio Ferretti had recently perfected. This new milk fiber was dubbed lanital (a compounding of lana, meaning wool, and ital, from Italia). The lanital production process that Ferretti pioneered went like this: first, scientists added acid to skim milk, which separated out the casein. The casein was then dissolved until it developed a viscous consistency. Next, according to TIME, the casein was “forced through spinnerets like macaroni, passed through a hardening chemical bath, [and] cut into fibres of any desired length.” The result? A substance that mimicked wool. To Mussolini, lanital was ingenious. Italy, like most nations, was wasting billions of pounds per year in excess skim milk. Lanital gave them an inexpensive way to repurpose it and, considering it otherwise would have languished, offered a lot of bang for their buck: 100 pounds of milk contained around 3.7 pounds of casein, which translated to 3.7 pounds of lanital. Though lanital was neither as strong nor as elastic as actual wool, Mussolini remained steadfastly delighted. This was the kind of Italian innovation he wanted more of. So in 1935, after his invasion of Ethiopia resulted in heavy sanctions from the League of Nations (a post-World War I prototype for the United Nations) that further isolated Italy, Mussolini turned his full attention to lanital. 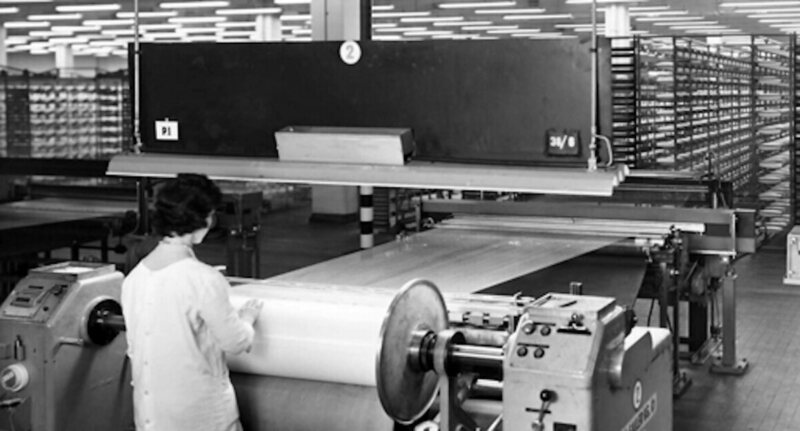 SNIA Viscosa received large sums of government aid, and its promising new milk fabric earned strong support: by 1937, an astonishing 10 million pounds of lanital were produced. 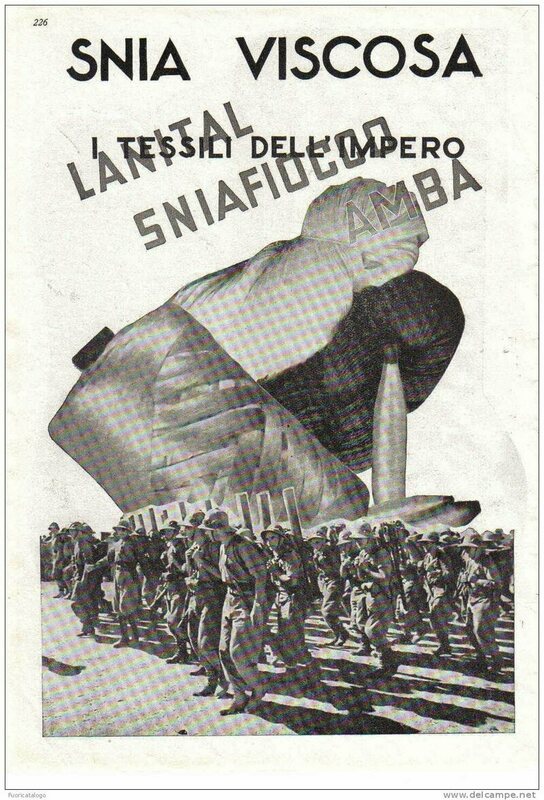 State-run textile boards began publishing propaganda posters urging citizens to “Dress in an Italian manner.” Futurists, delighted by the newfound prominence of milk fibers, enthusiastically praised the invention and the ingenuity of the Fascist government. The propaganda worked. Lanital became ubiquitous throughout Italy, and the Futurist dream of milk clothing seemed to become reality. 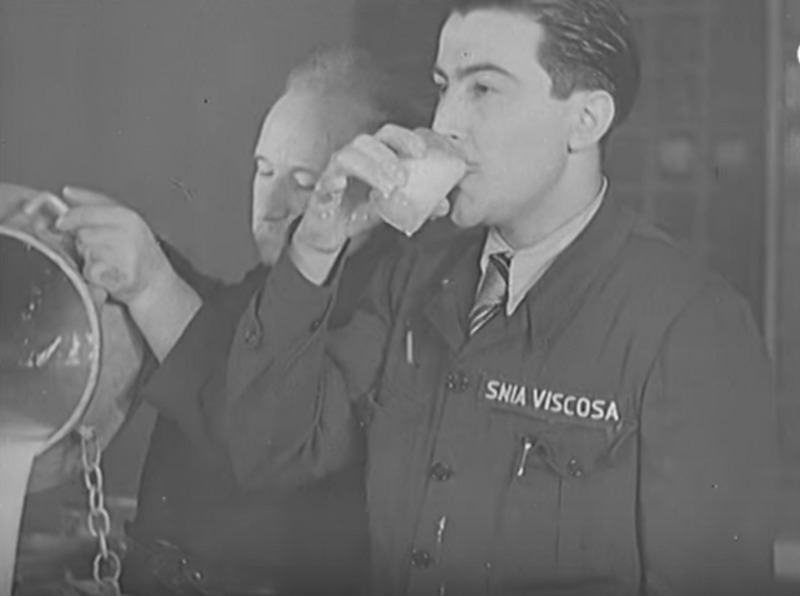 In fact, by 1938, SNIA Viscosa became intent on spreading milk-based clothing around the world. Two years later, it had sold patents to eight countries (Holland, Poland, Germany, Belgium, Japan, France, Canada, Czechoslovakia, and England). Yet there was one country in particular that SNIA Viscosa hoped to woo: the United States. The U.S. was a natural target for SNIA Viscosa’s milk fibers. Since the early 1920s, Americans had discussed casein as a potential bridge between the agricultural and manufacturing sectors and as a way to repurpose their 50 billion pounds per year of excess skim milk. In 1900, Henry E. Alvord, a president of multiple American agricultural colleges, suggested that casein be used in glue, buttons, and combs. During World War I, casein appeared in a paint that coated airplane wings; by 1940, it appeared in piano keys. Casein was also found in certain kinds of American paper, where it attached to minerals to give off a glossy sheen. So SNIA Viscosa thought—why not also in clothing? With the help of the Italian government, SNIA dispatched fashion emissaries like American journalist-turned-Italian-princess Marguerite Caetani to promote lanital clothing in New York. A December 1937 TIME article describes how Caetani recruited American socialites like Mona Bismarck—whom Chanel once voted the “Best Dressed Woman in the World”—to model high-end milk-based dresses for American audiences. Their efforts paid off: in 1941, a team for the Atlantic Research Associates—a division of the National Dairy Corporation—began producing lanital under the name aralac (“ARA” as in American Research Associates + lac, Latin for “milk”). The new milk fibers were a hit. As SNIA had hoped, the New York fashion scene fixated on aralac-based clothing, and aralac briefly denoted sophistication. But when the U.S. joined World War II, it found a more universal use: military equipment. Aralac was blended with rayon to produce hats, thus providing modern historians with a trivia fact to trump all trivia facts: during World War II, American soldiers wore milk to battle. By 1948, production shut down in the United States. Soon after, SNIA Viscosa itself began focusing its energy on other synthetic products. Its reputation had taken a massive hit after World War II, when lanital-infused boots, blankets, and military uniforms—which Mussolini believed would resist poison gas—in fact did little to protect Italian soldiers, and led to 2,000 cases of frostbite during a battle against France. Anyway, cheaper synthetic products were flooding the market, pricing out lanital. Yet that is not the end of the story. Over the decades, milk-based clothing has remained popular among futurists, and in recent years, the fibers have made somewhat of a resurgence. In 2011 there was the debut of German-based clothing company Qmilch, whose fashionable products are manufactured almost entirely with casein. Started by German microbiologist and designer Anka Domaske, Qmilch offers products that require fewer chemicals than the lanital of the 1930s and 1940s. A single dress costs between roughly $200 and $230 and is made from six liters of milk. According to Reuters, the fashion label Mademoiselle Chi Chi—a high-end clothing producer that is a favorite of American celebrities like Mischa Barton and Ashlee Simpson—has also begun selling milk-based clothing. Uniqlo’s popular Heattech apparel line, too, is partially made from milk proteins. Today, these clothes are especially attractive because they are both biodegradable and sustainable. In fact, as global society continues to emphasize reuse, one cannot help but think that perhaps Marinetti’s Futurists were right all along. Perhaps our future lies with the milk dress.